Swiff Player Developer Edition enables Flash and Flex developers to create tremendous PowerPoint Slide Shows. Control slide navigation during the Slide Show, write Flash applications that receive PowerPoint effects and react to them. Debug directly from Adobe Flash Builder. Your Slide Show will remain compatible with standard PowerPoint Remotes. 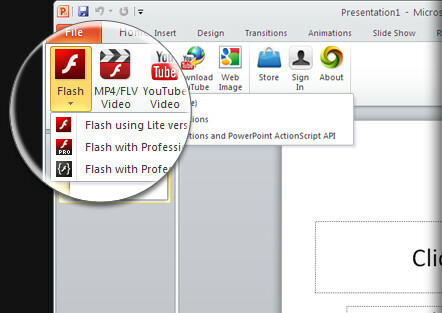 In addition to the features of the Professional Edition, Swiff Player Developer Edition adds access to the PowerPoint API through ActionScript during the Slide Show. The API allows you to navigate through the slides, read the slide history and elapsed time on each slide, receive PowerPoint effects applied to your Flash, manipulate the background bitmap behind your Flash and more. ActionScript: Jump to any slide in the slide show. ActionScript: Enumerates all the slides of the presentation and the slide show. ActionScript: Search for a slide with a specified title. ActionScript: Receive effects applied to your Flash. ActionScript: Access the slide history and elapsed time on each slide. ActionScript: Go back to the previously visited slide. ActionScript: Execute next or previous effect in the current slide. ActionScript: End the slide show. Access and change the background bitmap behind the Flash shape during the Slide Show. Debug your ActionScript code directly within Adobe Flash Builder. Compatible with standard PowerPoint Remotes.